we regret that you were inconvenienced by your missed appointment. We understand your frustration, as we know that your time is valuable and never want our customers to be disappointed in our service. We would like the opportunity to make things right for you, and we have been attempting to reach you to discuss the situation. Please contact us at 888-588-2315 x4195 or customersupport@empiretoday.com, and we will follow up with you. I thought I'd at least give them a shot at giving an estimate for the job I want done. Made appointment and then received several email confirmations and even a follow up phone call. I told them I would be here waiting for their rep. The rep never showed up, never called, nothing! I called their toll free number, gave them my info and was put on hold for over 10 minutes. Rep back on phone making excuses for their estimator and she talked so much I couldn't even get a word in edgewise. I had to shout at her to LISTEN to me, but to no avail! Finally I told her to shut the F up and learn how to handle a customer and that I would never consider using Empire. I followed up with an email to some clown who sent me one of the "estimate appointment confirmation" emails and I wrote that I would be writing on Pissed Consumer to warn others. BEWARE of this bunch! I'm going to find a local installer. 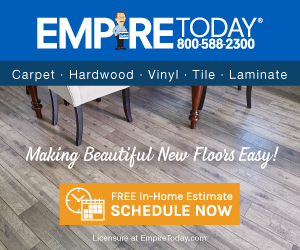 Product or Service Mentioned: Empire Today Estimate. Review #351992 is a subjective opinion of Ziddak.